Need help with a school garden? Here are some useful resources for creating, using, and maintaining school gardens. Whether you are a teacher, administrator, parent, or anyone else who is involved in a school garden, we hope you will find what you need here. We can also offer advice on gardening basics, training for adult volunteers, one time children's classes, or a school assembly presentation. 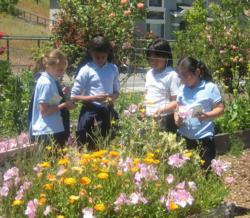 To get in touch with us, please complete and submit our School Garden Advice Request. We will respond in a timely manner once your e-mail address is confirmed. Planning and grants: The California School Garden Network has great information on planning a school garden and keeps an up-to-date list of available grants. Vegetables: We are lucky to be able to grow vegetables year round here in Santa Clara County. Use our Vegetable Planting Chart to find out which vegetables to plant when. Pollinators: Bees and other pollinators are a frequent topic for school gardens. Find suggestions for pollinator attracting plants and excellent information about pollinators at the UC Davis Häagen-Dazs Honey Bee Haven. Water-wise plants: For water-wise plant selections that are beautiful, tough, and low-maintenance, take a look at our Water-Wise Plants and the UC Davis Arboretum All-Stars. Pests and problems: Consult UC's encyclopedic collection of Home, garden, turf, and landscape pests to help identify potential pests and learn what to do. You can also contact our Help Desk by phone or email. Curriculum and training: UC Santa Cruz Life Lab and The Edible Schoolyard Project both offer much useful information. Weekly magazine: Youth Gardening from the American Horticultural Society has many school gardening ideas. Junior Master Gardeners: The Junior Master Gardener Program from 4-H could be a great idea for an after school garden club. There is an extensive teacher handbook full of week by week activities. The San Diego Master Gardener Program also has extensive school garden program information on their site. Please note: While we consider these listings reliable gardening resources and have made every effort to determine that the contact information is accurate, we do not endorse or recommend any resources other than those operating under the auspices of the University of California Cooperative Extension.